Background screenings are essential because they provide the necessary information needed to make quality hiring decisions. Organizations need and demand high quality background screenings because they want to increase safety, comply with specific laws and regulations and reduce the liability of negligent hiring by demonstrating due diligence. 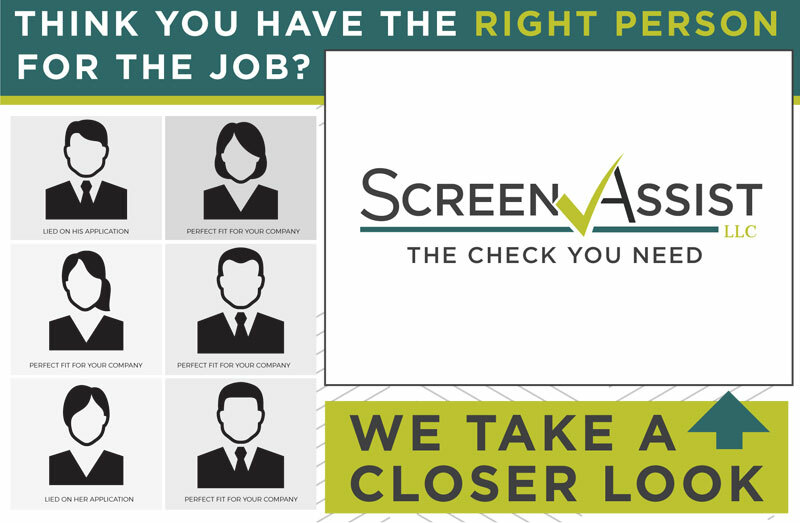 Screen Assist understands the importance of background screenings and that no two companies are alike. That is why we work with our clients to develop and customize a process to achieve their background screening goals. The information provided in background screenings primarily comes from public record information. The challenge is knowing where to look. Screen Assist has access to numerous resources and the know-how to find the information you need. Screen Assist is a consumer-reporting agency in compliance with the Fair Credit Reporting Act. With over 20 years experience, we are available to review and advise on your current in-house background screening policies and procedures. Screen Assist also offers an Applicant Tracking System. Our ATS is user-friendly, customizable and provides many features that will help simplify your hiring process. We want the chance earn your business. Contact Screen Assist to find out more.